One objection to installing an aprs tracker that is sometimes presented by prospective users is a reluctance to delve into geekdom and software setup. The traditional trackers are quite easy to configure, but I guess even that degree of customization is intimidating to some. The Byonics MT-RTG is the answer to those who express technophobia but still wish to have the safety enhancement of an onboard tracker. The heart of the MT-RTG is the TinyTrac3 encoder which carries well-proven technology. This encoder is paired with a ten-watt transmitter and regulated power supply which provides a package that is RTG (read to go). Since the tracker is delivered with the user's callsign and a generic config that is suitable for aviation tracking, there is no need to crack open the case or do any programming. However, the RTG is fully programmable like the other Byonics trackers for the user who wishes to customize the config. The software and user manuals are downloadable from the Byonics website. 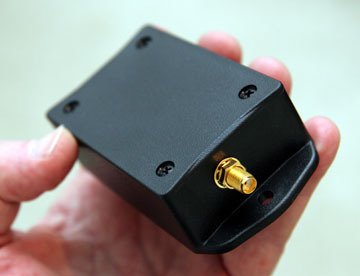 One end of the high-impact plastic case carries an SMA antenna connector. 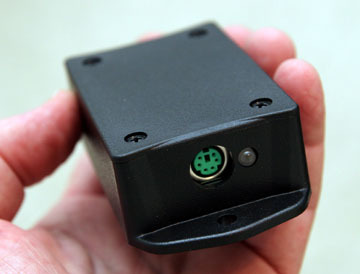 The other end has a standard 6 pin mini DIN connector for the supplied harness for 12v aviation or auto bus power and serial GPS data input. 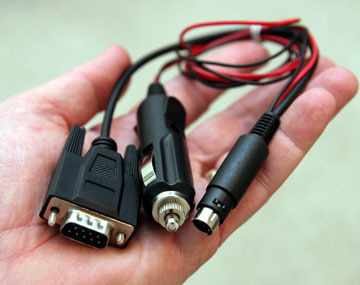 Since this is a readily available connector, it will be easy to fabricate a harness if a particular installation requires customization. The serial connector is also used for custom programming like the other Byonics trackers. Also visible in the photo is the dual-color LED that indicates valid GPS data and transmitter operation. The MT-RTG is available either with just the harness, or as a bundle that includes the GPS2 mini GPS receiver/antenna and a 20" magnetic base transmitting antenna. So....what we have is a very neat package that is about as close to plug-n-play as we can get. How does it fly? Very nicely, thank you. I slapped a magnetic 5/8 wave antenna on top of the car and took to the road to see if the little black box could land some beacons on the local digis. It had no problem hitting a couple of digis about thirty miles away. The MT-RTG was tested in the aircraft with a belly-mounted VHF-band whip antenna. The first flight was with the Byonics GPS2. The second was with the Garmin GPS35 that usually provides data for my tracker. In both cases the MT-RTG delivered flawless tracking. 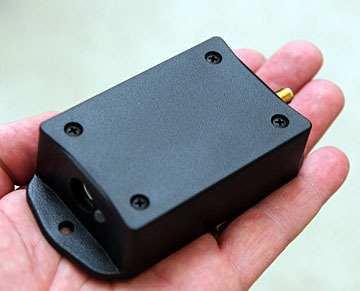 Aprs tracker packaging has been advanced several steps with this tracker. It is compact, ruggedly housed, preprogrammed, offered by a reputable vendor, and based on proven components. And the icing on the aprs cake...the price including the GPS and antenna is under $200! From now on, the MT-RTG is the device I will recommend to pilots who want the easiest aprs tracker installation for their aircraft.